Yorkshire residents are set to dive into new waters as Barr + Wray embarks on work on the Selby Leisure Centre. Main contractor Wates Construction has awarded aqua-leisure specialist B+W a £500,000 contract to install the water features for the centre. B+W will complete the design, supply and installation of a six-lane 25m competition and training pools, filtration and treatment systems and tiling works. Designed by architects Bradshaw Gass and Hope LLP, the facility will replace the Abbey Leisure Centre which was destroyed by a fire in 2013. With the centre partly funded by Sport England, the competition pool will have an extensive tiered viewing gallery for spectators. B+W will also install a world class timing and display system by Colorado Time Systems, the official provider of the American Swimming Coaches Association (ASCA). “Following the devastating fire, Selby residents have had limited access to fitness and swimming facilities. “Given Yorkshire’s strong sporting tradition, a state-of-the-art replacement is required by the community, while the addition of professional standard timing features and a competition pool will attract swimming contests. Work on the £9m leisure centre– supported by Sport England and National Lottery funding – began in February. Initial works are under way on the casting of the pool shells with the centre due for completion in early 2015. 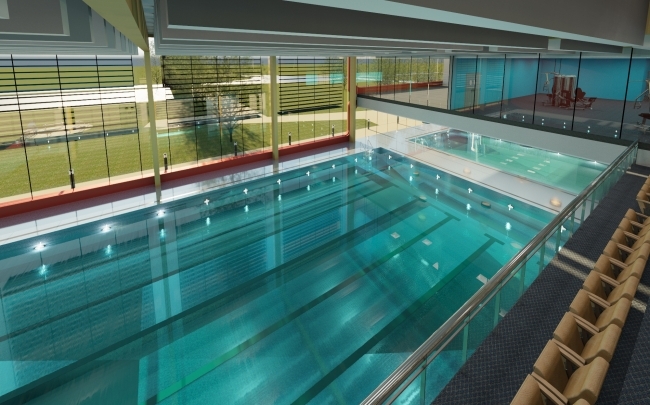 Barr + Wray’s recent pool contracts include Linwood Sports Centre, Pickaquoy Leisure Centre and Center Parcs in Elveden, while its spa division has delivered projects for luxury hotel brands such as Gleneagles, Jumeirah Group, Mandarin Oriental, Four Seasons Hotels & Resorts and Ritz Carlton.